Age-specific mortality rates rise steadily from around age 50-54 and more steeply from around age 75-79. The highest rates are in the 90+ age group for males and females. 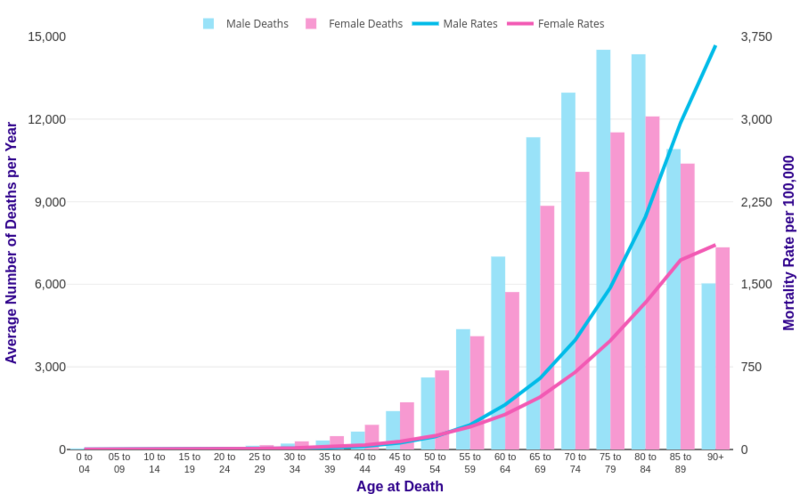 Mortality rates are significantly lower in males than females in the 30-54 age groups and significantly higher in males than females in the older age groups. The gap is widest at age 90+, when the age-specific mortality rate is 2 times higher in males than females. Adults aged 25-49 contribute around 5 in 100 (4%) of all cancer deaths, with slightly fewer deaths in males than females in this age group. 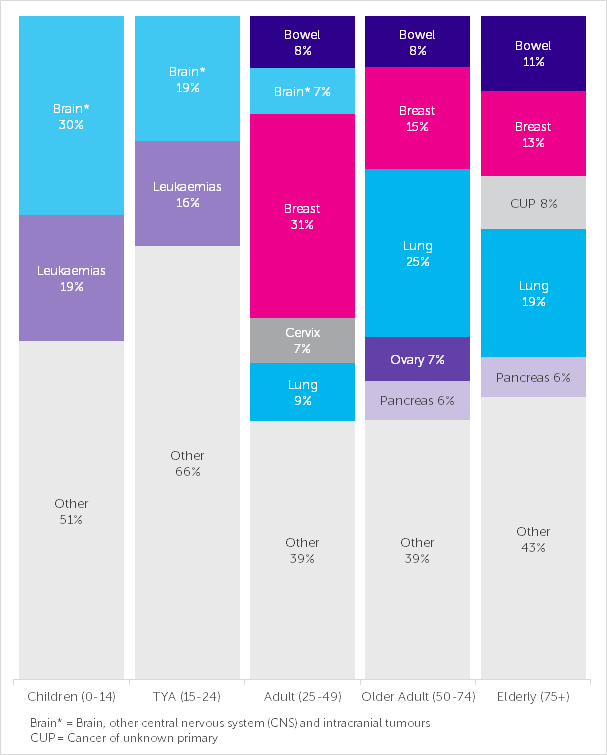 [1-3] Adults aged 50-74 account for more than 4 in 10 (42%) of all cancer deaths, and elderly people aged 75+ account for more than half (54%), with slightly more deaths in males than females in both age groups. Data is for UK, 2014-2016, ICD-10 C00-97, D32-D33, D35.2-D35.4, D42-D43, D44.3-D44.5. 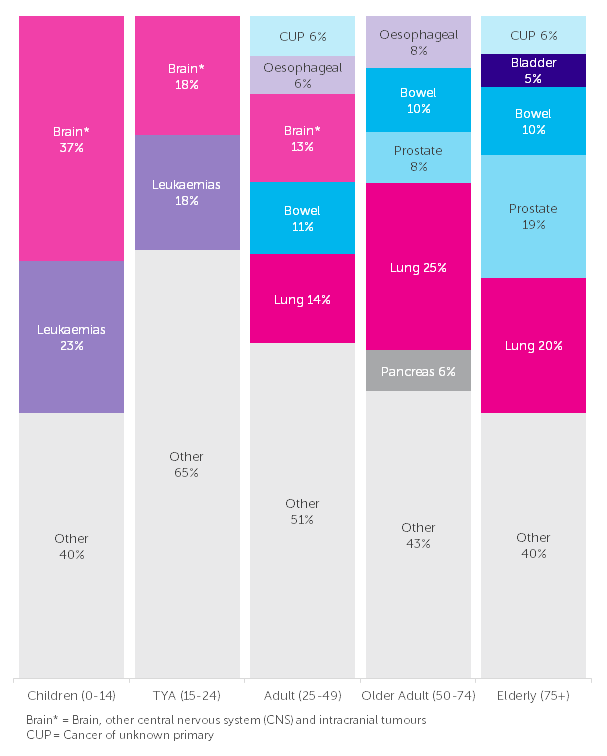 For the 25-49 age group, data in this chart do not sum to the all cancers combined total provided elsewhere, because 'Brain, other central nervous system (CNS) and intracranial tumours' includes tumours that are malignant, benign and of uncertain or unknown behaviour but only the malignant tumours are included in 'all cancers combined' total. For all age groups percentages may not sum to 100% due to rounding. Data is for UK, 2014-2016. Ages 0-14 and 15-24: Brain ICD-10 C70-C72; Leukaemia ICD-10 C90-C95; Other cancers ICD-10 C00-C69, C73-C90, C96-C97, D32-D33, D35.2-D35.4, D42-D43, D44.3-D44.5; All cancers combined C00-C97, D32-D33, D35.2-D35.4, D42-D43, D44.3-D44.5. Ages 25-49: Brain ICD-10 C70-C72, C75.1-C75.3, D32-D33, D35.2-D35.4, D42-D43, D44.3-D44.5. Ages 25-49, 50-74, 75+: Bladder C67; Bowel C18-C20; Breast C50; Cancer of Unknown Primary C77-C80; Cervix C53; Lung C33-C34; Oesophagus C15; Ovary C56-C57.4; Pancreas C25; Prostate C61; All cancers combined ICD-10 C00-97. 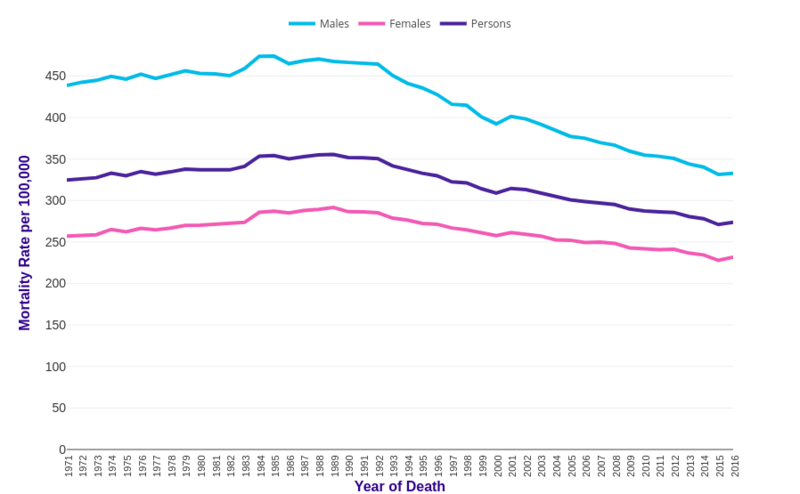 All cancers combined mortality rates have decreased overall in most broad age groups in males and females combined in the UK since the early 1970s. [1-3] Rates in 0-24s have decreased by 63%, in 25-49s have decreased by 52%, in 50-74s have decreased by 33% and in 75+s have increased by 15%. All cancers for people aged 0-24 includes all benign/uncertain or unknown behaviour brain, other central nervous system and intracranial tumours (ICD-10 codes: D32-D33, D35.2-D35.4, D42-D43 and D44.3-D44.5). All cancers for all other age groups do not include benign/uncertain or unknown behaviour brain, other central nervous system and intracranial tumours. All cancers for all other age groups do not include benign/uncertain or unknown behaviour brain, other central nervous system and intracranial tumours C00-97.